I thought that some of you would find it a bit easy, but the most diagnostic features aren’t visible in the image and it’s a nice specimen, so I went with it. 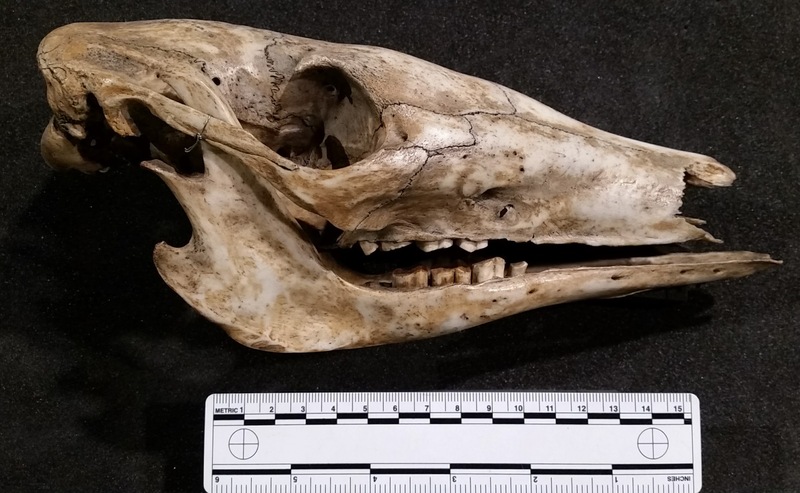 There is a bit of similarity with the skull of a ruminant, as noted by palfreyman14141, while Gerard pointed out that it’s from Africa and James M. Bryan was the first to drop a solid clue pointing to the correct species. As jennifermccaire says, it’s the very first on the list (assuming the list is alphabetical) – an Aardvark Orycteropus afer (Pallas, 1766). Picking up on palfreyman1414’s observation about it looking like a ruminant, Allen Hazen asked an interesting question about the teeth, because the diet of these bizarre looking animals almost entirely consists of ants and termites, and most other mammals with a similar diet (like Pangolins and Tamanduas) have no teeth at all. The weird teeth of the Aardvark, made up of tiny dentine tubules. A 60-80kg mammal living in hot and water-scarce regions of Africa, will struggle to get enough moisture from ants and termites to survive, even if they are nocturnal and sleeping in burrows during the hottest part of the day. So how do Aardvarks do it? There is actually a species of cucumber that has a symbiotic relationship with Aardvarks, and it’s unimaginatively, but descriptively, called the Aardvark Cucumber Cucumis humifructus Stent, 1927. These weird fruits develop deep underground and have a tough skin that keeps them viable for months. Outside they’re like a leather golfball, but inside they’re watery like the cucumbers you’d put in a Hendrick’s gin and tonic – and that’s where the Aardvarks get their moisture (the Cucumber, not the G&T). Nothing but the Aardvark has a nose sensitive enough to detect the plant, or claws powerful enough to dig into the hard-baked earth to access the fruits (or possibly only an animal that mostly eats ants is desperate enough for some culinary excitement to go to all that effort for something that the rest of nature views as a lacklustre garnish). The Cucumber’s seeds need to pass through an Aardvark to become viable and those seeds get distributed underground with a healthy dollop of fertiliser in what is otherwise a harsh environment. The leathery skin of the Cucumber is almost certainly the reason why Aardvarks are alone in having teeth amongst the termite and ant-eating mammals. It also explains why those teeth grow constantly – and why they get so worn down. Now you may be wondering if I’m making all this up, but honestly, the world really is that weird (and wonderful) when you look at it closely enough! What a lovely cucumber story! Many thanks for this. That is so cool – thanks for the info! What I found, when looking for more into on aardvarks, is that magicians make a charm from the heart, skin, forehead, and nails of this animal.The charm is said to give the owner the ability to pass through walls at night! But where do pangolins, for example, get their moisture from? They alo feed on ants and termites and live in arid climates. The cucumber bit is … amazing. It is fortunate that you posted it in late May rather than in early April! “However, from the oldest known O. minutus to the extant O. afer, the teeth of the aardvarks are very similar” (from the appendix on traits considered). So the Aardvarks, in addition to being weird, continue to be enigmatic. Thanks for opening a discussion about aardvark 😀 And thanks to Allan Hazen for quoting one of my papers. 1) Aardvarks do not ONLY live in arid environment today: they are also present in the African rain forest (e.g. Congo, Ghana) (see the latest Kingdon “Mammals of Africa” (Vol 1) 2013 or the IUCN Red List (http://www.iucnredlist.org/details/41504/0) for more info). Hence, it is hard to tell if fossils indicate this or that environment, and that is why I did not make assumptions in my paper in 2009. 2) The aardvark teeth remain mysterious in their origin and use. Aardvark do not need teeth to digest its prey but it do grind something with them (wear marks on their surface) . However, I don´t think it is that cucumber, foremost because the Aardvark cucumber is only marginally present in the distribution area of the aardvark (i.e. all of Africa, south of the Sahara). So the aardvark can totally survive without the cucumber. Hence the sometimes called “symbiosis” is not a true one, and rather probably a coincidence, some individual aardvarks opportunistically getting to eat some of these fruits. Study of the ecology of the aardvark by Taylor and other (e.g. Taylor et al. 2002, 2003) make the same observation: no symbiosis. One important factor to consider here, is that aardvark teeth are EVERGROWING, which means theoretically that if it does not grind them, they would grow so much, the animal could not close its mouth anymore (I have never observed such case, even in Zoo animals). Furthermore, the teeth lack enamel, and consist only of dentine (a softer material). So even few grains of quartz, inhaled while eating termites and ants, would suffice to wear the teeth of an aardvark. 3) The oldest known aardvark (~21 million years old) had already these peculiarities: evergrowing teeth made of dentine. Unlike many other mammals, it is quite impossible to describe enough characters on the teeth of Tubulidentata, to be of use in a phylogenetic analysis. Hence many fossil, only known from dental remains, cannot be put in the matrix (wouldn´t make any sense). Yet I tried my best to attribute them to the most likely genus. 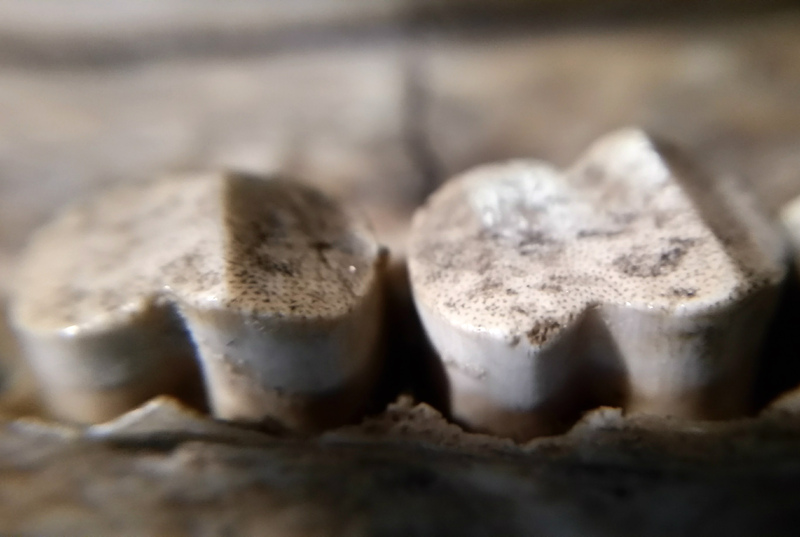 Hopefully, we will soon find a fossil Tubulidentata older than the Miocene….